With the recent kick-off of Araxi Restaurant’s Longtable Dinner Series in Vancouver, al fresco dining is on the mind. 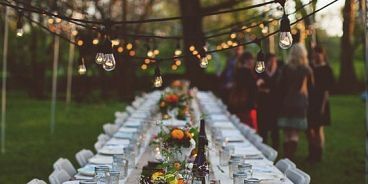 Here are some tips for hosting a magical outdoor dinner party. First of all, twinkly lights strung up around your venue are key. They instantly create a magical mood. Find white circular lights at The Cross in Yaletown, colorful versions at Spirithouse on Main Street, or here on Etsy. Go above and beyond by rigging up a chandelier above your long dinner table. Flowers are also crucial. It’s fun to pick them wild , but if you’d rather go the florist route, Garden Party and The Flower Factory are fabulous at what they do. Floral centerpieces are a must, but try adding small flowers to each guest’s napking wrapped in rustic string. As for tableware, mix-and-match can look so cute. Do the thrift shop rounds and pick-up inexpensive character dishes for an eclectic creative touch. If you have enough, stack them for a layered look. And how about surprising your guests with a macaron waiting for them on the plate? My friend and recent bride, Erin Sousa, did this at her wedding and even included a little message (“Eat Dessert First”) in icing (she ordered them from Soirette).